The collaborative installation Map Me took place in the foyer of the Alice Springs Convention Centre throughout Art at the Heart Conference in October 2008. 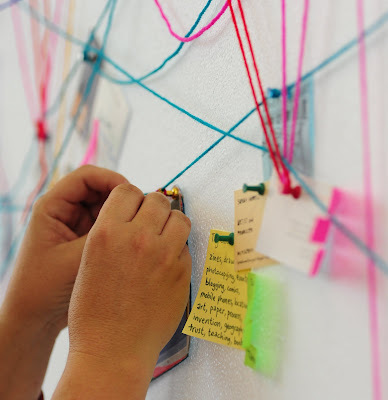 Delegates and visitors are invited to bring a picture or a business card to the conference to stick on the wall and connect their presence to the people they know. As the exhibition and the conference progresses, the walls will be filled with representations of individuals while the room comes to life with threads of connections. Thanks to everyone who took part. Special thanks to to Nicky Schonkala, Kieren Sanderson, Andrew Moynihan and James Spiers.